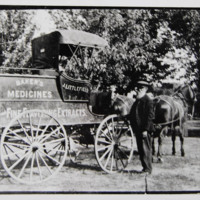 Joseph Littlefield, pictured here next to his pharmacy on wheels near his house in Aurora, Nebraska in 1906, lived a long and eventful life.Born in Peoria County, Illinois in 1840, Littlefield served almost three years in the Civil War as a private in company C of 102nd Illinois volunteer regiment. After the war he returned to Illinois and married Hellen Crandle. In 1879 Joseph Littlefield and his family that included his mother Joanna, who was 71 at the time, came to Nebraska Clear Creek area, Sherman County to homestead. Hellen died in 1881 and six years later Joseph, now 47, married 24 year-old Lotta (Charlotte) Roberts, and had 7 more children with her, of whom only 5 survived. Littlefield moved to Aurora, Nebraska in 1904 and died there in 1911. 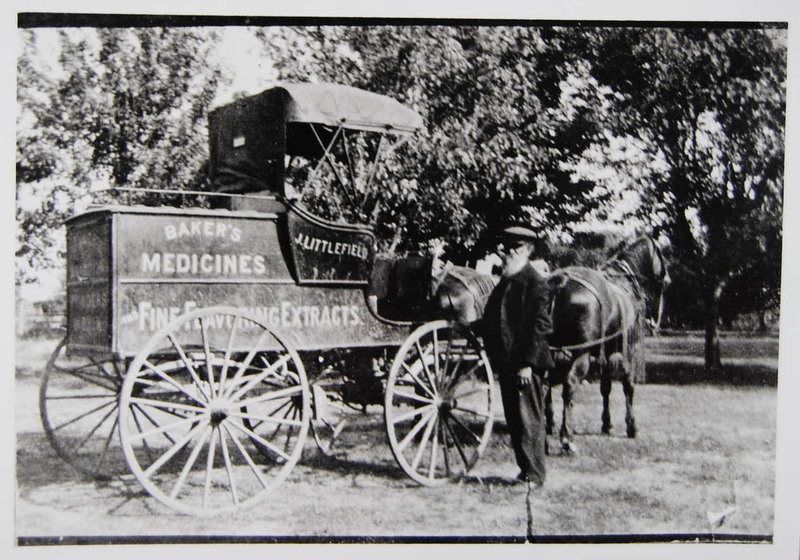 Aged 63 in 1904, Joseph Littlefield could not farm any more to support his family, so he had to become a travelling salesman selling Baker's medicines, flavoring extracts and spices. This photograph might have been used as a business card that Littlefield gave to regular customers. The photograph comes from the collection of Terri and Dave Mabon. Dave Mabon is Joseph Littlefield's great-grandson. Jay Small Postcard Collection, "Baker's Medicines, James Quilliam Salesman, Montgomery, Indiana" in Indiana Historical Society http://images.indianahistory.org/cdm4/item_viewer.php?CISOROOT=/P0391&CISOPTR=1063&CISOBOX=1&REC=1 (accessed May 7, 2012). Littlefield served almost three years in the Civil War as a private in company C of 102nd Illinois volunteer regiment. After the war he returned to Illinois and married Hellen Crandle. In 1879 Joseph Littlefield and his family that included his mother Joanna, who was 71 at the time, came to Nebraska Clear Creek area, Sherman County to homestead. Hellen died in 1881 and six years later Joseph, now 47, married 24 year-old Lotta (Charlotte) Roberts, and had 7 more children with her, of whom only 5 survived. Littlefield moved to Aurora, Nebraska in 1904 and died there in 1911. “Joseph Littlefield, Aurora, Neb., 1906,” History Harvest, accessed April 21, 2019, https://historyharvest.unl.edu/items/show/194.